Property buyers are choosing new-build homes because they meet a range of priorities which go well beyond the traditional focus on location, new research shows. 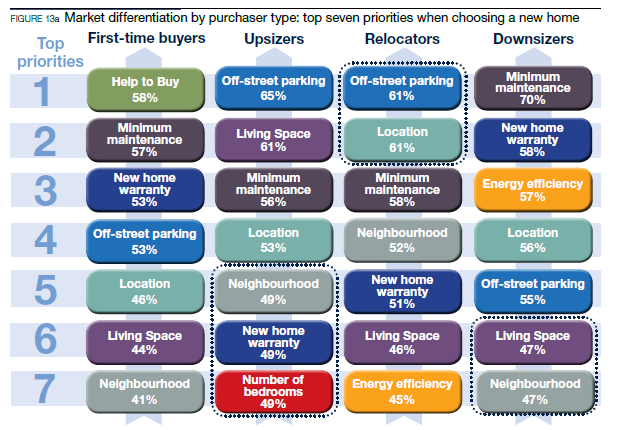 Beyond location, location, location: priorities of new-home buyers, a collaborative report produced by the NHBC Foundation and Savills, found that while location remains a key influencer, buyers of new-build homes also placed high importance on a series of other features, such as the design of living space, off-street parking, a new home warranty, low maintenance and increased energy efficiency. The report, based on the views of more than 5,400 people who have bought new-build homes in the last four years, identifies seven core priorities which influence property choice. It found that although the proximity of amenities, such as schools, NHS services and local transport hubs were important considerations, they did not drive a house purchase decision as much as the appeal of key features of the home itself. Homes in the report are analysed in three categories of location: high-density urban living, medium density in residential or regenerated areas of large towns, and suburban homes which are generally situated within 3km of urban areas. The priorities of different purchaser types – first-time buyers, upsizers, relocators and downsizers – are also explored. For different buyer types there was more variation in the order and choice of priorities, and buyer types could be further differentiated by the amenities they wanted to be near to. Almost six out of ten (58%) first-time buyers surveyed considered the Help to Buy scheme very important and placed a greater emphasis on proximity to transport and shops. Upsizers rated off-street parking as their most important feature, followed by the size and design of living space and were more likely to favour a property near a primary school and local NHS services. Relocators also valued off-street parking, location and neighbourhood quality among their top priorities. This group of buyers is looking for proximity to NHS services and transport links, as are downsizers, who placed low maintenance, a new home warranty and energy efficiency as the most important factors behind their move. The report found that 77 per cent of people living in suburban homes had two or more cars and tended to rely less on walking to get to key amenities, compared to people in the urban locations. First time buyers in urban settings placed the greatest store by proximity of a train or tube station (with 47% rating as very important) compared to just over 30 per cent of other respondents. For downsizers, the figure falls to just 17 per cent. (See table below). Research also showed that priorities appear to be shifting, with energy efficiency moving up the priority list for home buyers and issues such as safety and security no longer registering so highly. Assistance onto the property ladder from Help to Buy had been “crucially important” for first time buyers, demonstrating how rapidly a supportive policy initiative can impact on the housing market, the report concludes. Commenting on the report NHBC’s Head of Standards, Innovation and Research Neil Smith said: “The report shows that whether you’re a first-time buyer, relocator, downsizer or upsizer, buying a new home is about more than just location, location, location. “Buyers are becoming more discriminating and make complex choices based on a number of factors when purchasing a new-build property. These include the lower levels of maintenance compared with older homes, size and design of living space, new home warranties, energy efficiency and the quality of the neighbourhood, as well as proximity to amenities and services. Savills research analyst Gaby Day said: “The results of this survey are significant in understanding the broad motivations for people buying new homes, but also how this subtly differs by the location they are looking to be in, as well as the stage of life they are at.